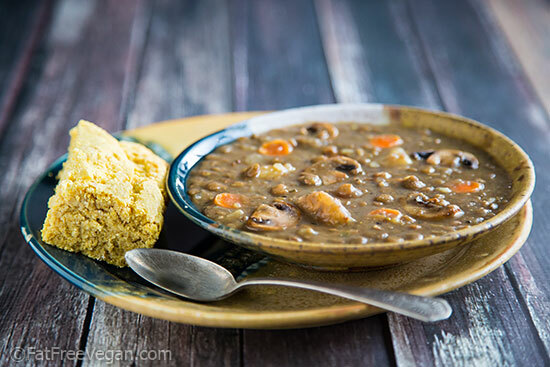 This hearty vegan lentil soup is more like a stew and will appeal to the pickiest of eaters! Every time my parents come to visit, I tend to make the same dishes. My mother usually requests a stir-fry, and my daughter, seeing this special occasion as a opportunity to have her favorite dish, asks for lasagna. Sometimes I cook up a Southern meal of lima beans and greens or a vegetable soup, but the overall theme is simple, basic dishes that are suitable for vegans and omnivores alike. A couple of weeks ago, my parents were here for a few days and I wanted to cook them something new but with flavors that would be familiar to them. And I wanted it to be fast and easy. So I settled on this lentil soup, which is familiar because it uses the same flavors my mother used in her beef stew. And it’s easy because all of the ingredients go into my electric pressure cooker at the same time and cook/rest for a total of 25 minutes. I added a big salad and my basic cornbread for a hearty meal that all of us enjoyed. 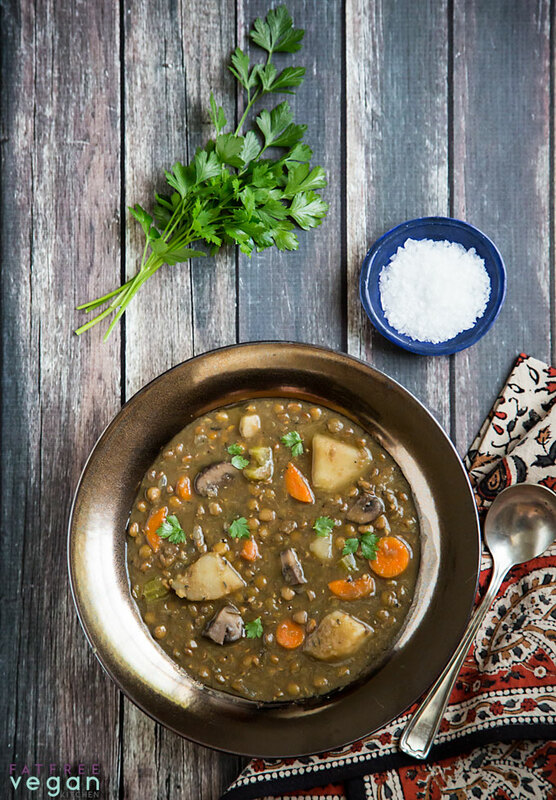 This vegan lentil soup is almost, but not quite, a stew. I used big chunks of carrots and potatoes, and by using a little less liquid, you could make it into a stew, though I like it soupy so that I can dip my bread into it. I served it in these gorgeous blue and yellow bowls given to me by my brother Bill and sister-in-law Kate. They were made by Kate’s father, Rick Pride, and as soon as his website is up, I’ll link to it so that you can get some of his beautiful pottery for yourself. A pressure cooker makes this a fast meal, but it’s still an easy dish to prepare even in a regular pot. Just allow an hour or more for the lentils to soften. Pick over the lentils and rinse well. Put them into the pressure cooker along with the water or broth. Check to make sure the lentils and potatoes are tender; if not, cook, covered but not at pressure, until done, adding water if it seems too thick. Remove the bay leaves, and check the seasonings, adding more poultry seasoning and salt, if desired. Garnish with chopped fresh parsley, if you like. Nutritional Information includes two teaspoons Better Than Bouillon, which contributes 170mg sodium per serving. Each serving is 2 Weight Watchers Freestyle smart points. This post contains affiliate links. When you buy something through them, I receive a commission that helps support this site. Thanks for your purchase! I made this over the weekend and it’s absolutely delicious! 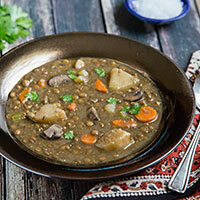 The seasonings are perfect and the chunky veggies with the lentils make it so hearty and satisfying. A real comfort dish! I made this for lunch this morning and it is outstanding! My daughter gives it her stamp of approval, too. We both had seconds. I made this Sunday night and it was excellent! This is my new favorite soup! It is so hearty and filling. I love the chunks of potato and carrot. I have made this soup 3 times so far, and it is my new favorite! Thank you so much! Yes I was so inspired by this recipe I went and bought myself a pressure cooker. Best ever inspiration and awesome soup!! Thanks!! I made this today and it is absolutely delicious…I always make a basic lentil soup and this is so different. The flavor is just wonderful! It would also be great with a bit of fresh spinach a few minutes before serving. I’m going to garnish with a bit of Romano cheese. Just made this soup in my Instant Pot, it is so tasty!!!!! And what a good idea to start by heating up the lentils in the broth while cutting te veggies. Thanks so much for this great recipe. Greetings from Amsterdam, the Netherlands. What setting name did you use with the cover off to heat? Sauté? Yes, Sauté on the Instant Pot. We had this for lunch today. I thought it was very good and satisfying! Will make again. I also made your “pear spice upside down cake” last night… it was awesome!!! Thanks, Susan! I appreciate your recipes and posts. Made this for dinner last night. It was so delicious! Thanks for the recipes Susan! What kind of mushroom works best with this flavor? Baby portobello? Baby portobello or regular mushrooms—both are good. OMG! This soup has WONDERFUL flavor…so nutritious and easy to make. I did use 2 boxes of Vege. stock instead of water. I made copies of this recipe AND saved it in my Cloud….This will be a repeat many times ,for sure. After hemming and hawing for several years (should I or not buy an Instant Pot), I finally purchased one this week. I want to make this recipe tonight and I’d like to confirm size. Do you use a 6 quart for your recipes? or is it bigger? I’ve followed you for years and never had a recipe disappoint me. My first recipe was mushrooms berkely (minus the butter). This will be my second. I use the 6-quart Instant Pot for all my recipes, so if that’s what you have, you’re good to go. I hope you enjoy both the IP and the soup! This is such a delicious recipe! I even made it low-sodium and it was still delicious, which isn’t always the case with soups. I also puréed a bit of it in the Vitamix and it made for a wonderful texture. The simplicity of throwing everything in the cooker is really time-saving. Susan, thank you for sharing your talents with the world! Made this two nights ago with Rancho Gordo black caviar lentils and it was fantastic! Really reminded me of a stew my mom would have made when I was growing up, except with beef. It was a perfect dinner for my WFPB family. Had it with a side of lovely Delicata squash from our farmers market. I just made this today, and all I have to say is WOW! It’s SO good! I made it in my crockpot instead of the Instant Pot. In case someone would rather crockpot it, it took about 4 hours on high. Thanks SO much for this awesome recipe, Susan!